Gold Just Got This Contrarian “Soft” Signal - Are Gold Stocks in Favor? In July, Vanguard made a seemingly routine announcement. It changed the name of a mutual fund. Well, Vanguard isn’t just any old mutual fund company. With $5 trillion in assets, it sets the pace for millions of customers simply by dictating what kinds of investment choices it offers. So it’s a sign of the times — and a brewing opportunity — when a firm like Vanguard finally throws in the towel, and decides to take the precious metals out of its flagship precious metals investment fund. That’s right. Starting late this month, the Vanguard Precious Metals and Mining Fund (VGPMX) will be renamed and restructured. Hello “Vanguard Global Capital Cycles Fund” (whatever that’s supposed to mean). I understand why Vanguard is doing it. If your goal is to sell investment products, you’re not going to sell many when the asset in question is down 35% since 2012, and going seemingly nowhere but down as fast as the drip-drip-drip of a leaky faucet. On the other hand, sometimes markets send what I call “soft” signals — if you’re willing to step back and take a contrarian view. Mutual fund companies send those signals on a regular basis, in what they offer (and don’t) to clients. For example, a little less than a year ago, ProShares offered the Decline of the Retail Store ETF (NYSE: EMTY). This exchange-traded fund must have seemed like a slam-dunk winner at the time. It’s now down more than 23% from inception. The famous BusinessWeek “The Death of Equities” cover in 1979 is another of these soft signals. After a decade of flat-to-negative returns, the headline must have seemed right on target to BusinessWeek’s editors at the time. Any financial adviser of that era would have felt perfectly confident to throw in the towel, and tell customers to skip the stock and bond markets. One year later, the S&P 500 Index was up 20%. Four years later, and the index rose by 60%. Granted, I’m cherry-picking examples here. It’s hardly a “cause and effect” phenomenon. Then again, the yin and yang of contrarian market calls tend to echo through history, fooling experts no less than amateurs. Think back to 1999 to 2002. The Bank of England decided to sell off a big chunk of the U.K.’s gold reserves. The central bank auctioned nearly 400 tons of the stuff. Why bother owning it, the thinking went, when gold was at its lowest price (less than $300 an ounce) in 20 years? You guessed what happened next. By 2004, gold was up 50%. By 2005, it doubled in price. By 2011, bullion was up more than 500%. And here we are in 2018. Right now, gold is out of favor. It may become even more out of favor between now and the end of the year. 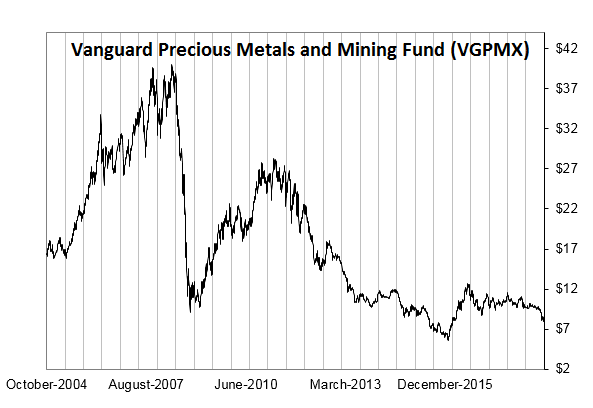 But my hunch is that Vanguard is sending us a bullish “soft” signal with its decision to rename its precious metal fund.